It has been a very busy week at the office. Who am I kidding? It has been a busy month. We were relocating, planning a fall fundraiser, trying like crazy to win a fancy schmancy Nike Girl Effect Challenge and sending out a newsletter (the first one I crafted all by my lonesome). I live on adrenaline and ridiculous expectations. In my rushing about to do this, that and the other thing, I had to stop by PostNet to send out some mail. The sign in the window said PASSPORT PHOTOS HERE. So I asked the gentleman to snap my photo. 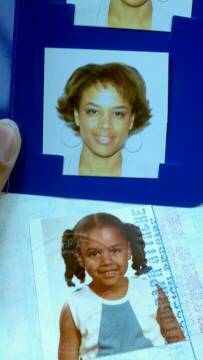 I just so happened to have my old passport in my purse. I had been carrying it around for at least a month after discussing with Jackson (see: Executive Director) my trip to Uganda. For those of you who are new around here, my friends and family raised over $1,000 in honor of my birthday to help me build a grandmother house. Reading all of the notes they left on my wish page made me tear up. It is required that I visit our projects in Uganda during the first year of my employment. That milestone was met over a month ago. Life got in the way. The daily function of my job got in the way. I didn’t press for it. That may have been a mistake. I know my work is important. I know that their are grandmothers with access to better housing and children wearing sharp uniforms I helped raise funds for. I know that there is clean water in pots and fresh milk in young bellies. I know that grandmother baskets were shipped all over this country because I drove them in my swagger wagon and dropped them at the FedEx shop that knows me so well, I don’t even have to stay for my receipt. I know in my mind but my eyes have yet to see the evidence. I have only met one of our students. I have never met any of our Ugandan staff members. I haven’t seen the beautiful Desire Farm and all of the fresh food grown in it. I have not seen the children sing and dance songs to prevent HIV/AIDS in their community. So now I have asked that my trip be scheduled for the end of January. It is time to go and see for myself. I have a hefty amount of high fives to hand out to my star students and at least one grandmother house to check on. towards programs for girls living in poverty. Please click here to make a donation!